Aside from offering great food, Grazia offers a lot back to the community; things such as holding bene ts for local softball teams and the Lions Club. Adrian says that between the Pearland and Clear Lake locations of the restaurant, they raised around $200,000 in 2017 to give back to the community. 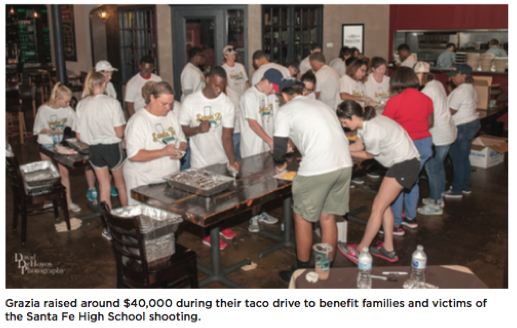 They even set up a taco drive to benefit the victims of the recent Santa Fe High School shooting. The idea for the taco drive actually came earlier, in 2016 when he wanted to do a bene t for the family of a Pearland of cer who was killed by a drunk driver. The menu features items like Cajun dusted scallops, red sh with a craw sh cream and lasagna wrapped into egg rolls. The important question is, what does Adrian recommend? But the Mike & Jen, so named for his brother and sister-in-law because Mike is the person who came up with the idea for this dish, and while Adrian thought it wouldn’t work, it is now the best seller on the menu! Just don’t let Mike know, Adrian still tells him it doesn’t do very well. To give himself a little credit for his own menu, he says you can’t miss out on the Adrian’s Art Pizza, which is a pizza topped with all of his favorite toppings – including wagyu meatballs and house-made Italian sausage.